Christmas is coming up..and fast. As usual, around this time every year I suddenly realize how close it is to Christmas time and I panic. You’d think, since Christmas is every year, I wouldn’t be so surprised when it gets to that time of year. I mean the date doesn’t change. It doesn’t just randomly pop up yelling “surprise!” So anyway, I have very little time to get all that I would like to get done before the big day. My neice and nephew are pretty much the only ones I plan on making gifts for. Hailey loves Hello Kitty so I plan on making her a pillow with a picture of HK on it, and perhaps her mane on the back. She will also get the HK teddy I made her since I never gave it to her… I know, I am a terrible aunt lol. I found this pattern for a HK ear flap hat. I started it last night and it worked up quickly.. though I’m not too sure about the size, mine looks alot narrower than the creators. I also found this pattern for a monkey hat for Aiden. His mom calls him a monkey so I thought it would be cute. I participated in another swap at crochetville and my partner sent me some really nice yarn which I can’t get in any stores up here.. she was from the States. 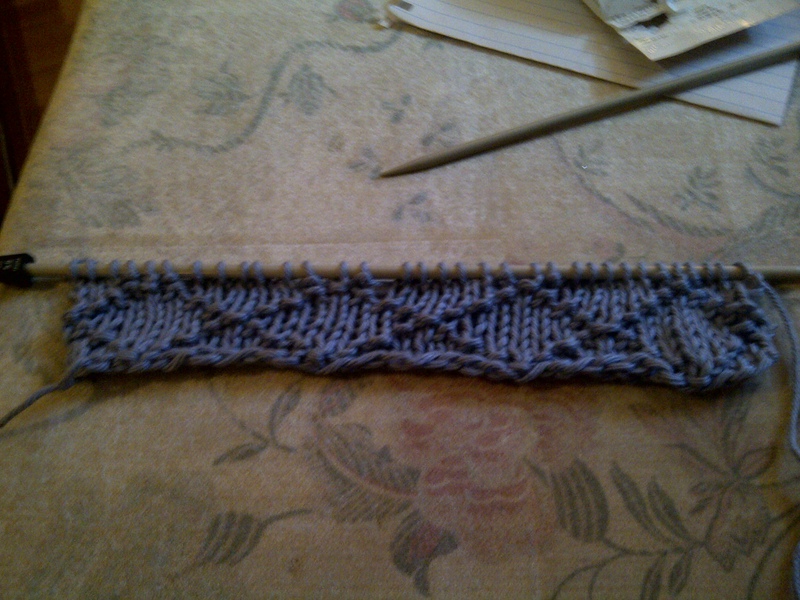 The yarn is I Love This Cotton from Hobbly Lobby, colourway is Summer Sky. It is soooo soft and has such nice drape, when I get a chance I will definately have to order some online. I digress though.. So it has been pretty cold here lately and since I got this lovely yarn, I would make myself a scarf. I though I would knit it instead of crochet because I really need to work on my knitting skills and let’s face it, a scarf isnt brain surgery so I figured I would be successful. Looking through my copy of Donna Kooler’s Encyclopedia of Knitting, I found some really pretty stitch patterns. I finally settled on the Diamond Brocade pattern. I don’t really know why but I had to restart it about 5 times because I kept messing up. 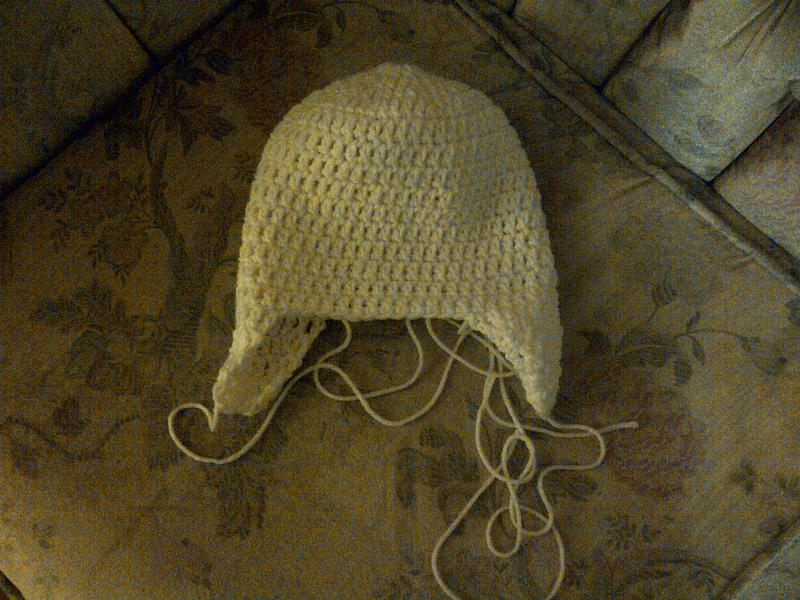 I got frustrated and put it down to start on the HK hat or my neice. Well this morning I decided to tackle it and I am loving how it is looking. 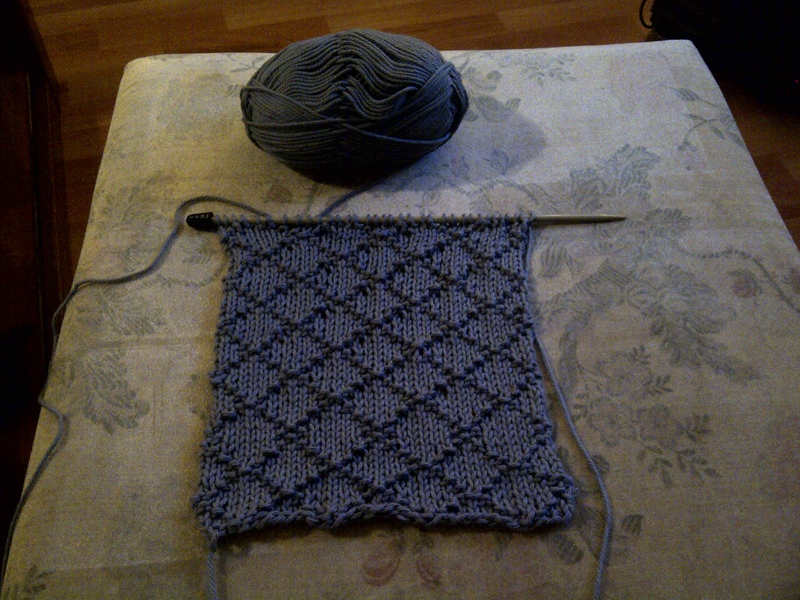 I’m surprised at how fast it’s working up… not as fast as crochet does but alot faster than I thought it would. That I am not a very good blogger. I want to be and I want to blog and I also mean to. But somehow I just haven’t. Maybe instead of a New Year’s resolution, I will have a November resolution; which will be to blog more often. Plus a shawl, a teddy bear and penguin for my aunt and cousins. Over extend myself much? Oh well lol. Wasn’t she thoughtful? I can’t say enough how much I have enjoyed getting to know her and to swap parcels with her!